MD12 Arm with Laptop Computer Tray | ICWUSA.com Inc.
With your Laptop Tray mounted to the MD12 extension arm, you can move your laptop computer exactly where you want it. Effortlessly raise and lower the arm. 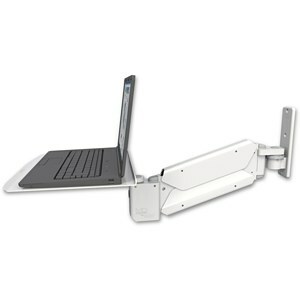 Swivel the laptop tray and rotate the arm at the wall mount. Slim design fits comfortably in tight spaces. When not in use, flip the laptop tray up and stow the unit. The MD12 Arm rotates 180° at the wall and raises and lowers 17″ (43.18 cm). It stows compactly 4.5″ (11.4 cm) from the wall. The laptop tray swivels independently from the arm. The arm is built with aircraft-quality aluminum and heavy-duty internal components for strength, durability and light weight. This unit has an attractive, lasting finish. Hand assembly ensures that a quality product is shipped to you. Laptop tray is also available on the MD18 arm for longer reach.